Gluten-free fad: Don’t be annoyed, says celiac disease memoirist. If an appearance on South Park is a sign of cultural saturation, then we have reached peak gluten-free. In a recent episode, gluten is banned in the town, and men in hazmat suits force a beer drinker into quarantine at Papa John’s. 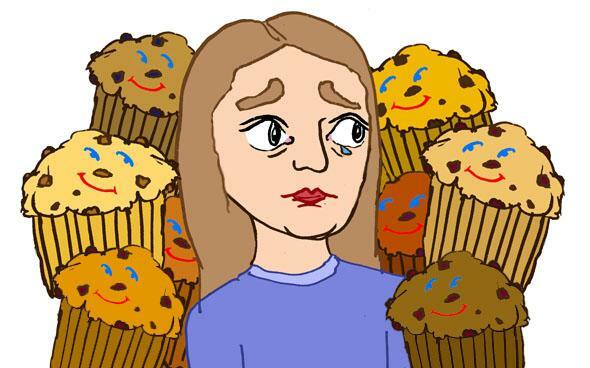 Mocked in New Yorker cartoons and lampooned by Jimmy Kimmel, gluten-free eating has become a staple of satire. It’s shorthand for solipsism, for a certain kind of over-privileged self-care. But I’m here to speak for the silly ones, the dim bulbs, the gluten avoiders. I have a world of sympathy for food fad followers. I once was one. In the early ’90s, when I spent a college semester in Bogotá, Colombia, I would walk an hour from my apartment to a health food store that sold fat-free whole-wheat bread. I’d been having stomachaches, and friends told me I’d feel better if I cut fat out of my diet and ate whole grains. I ate the loaf on the way home from the store, stopping periodically as my stomach seized up in pain. The doctor I consulted told me that Bogotá’s violence was causing me anxiety. A few years later, when I was living in a small town in western Colorado, I drove to the nearest hospital after weeks of frightening fatigue. The doctor I consulted told me I had “woman problems.” There was nothing he could do to help. To help myself, I became macrobiotic, because everyone around me was becoming macrobiotic. I paid a 16-year-old hippie girl who cooked for the local co-op to teach me about the diet. She lived high on a mesa where she pulled wheat gluten in the bathtub to make seitan that her mother would sell. I ate this seitan, looking out the window at the mountains, and waited to feel better. I visited yet another doctor in San Francisco in the late ’90s. My periods rarely came, I had sores on my tongue, my teeth occasionally broke in half. I was sent home with a trial pack of antacids. I had irritable bowel syndrome, the doctor said, and should avoid spicy foods and dairy. So I became vegan like my roommate, sprinkling her nutritional yeast on my rice and lentils. For years I ate exactly as Michael Pollan now exhorts us all to eat. I ate “food. Not too much. Mostly plants.” And I felt terrible. By the time I moved to New York in 2000, I couldn’t turn my head or carry a purse because of the constant pain in my neck. A doctor, alarmed by my iron levels and concerned that I had an ulcer, ordered an endoscopy. I was diagnosed with celiac disease, a condition in which gluten wreaks havoc on a body. It had destroyed my intestine’s absorptive capacity, leaving me unable to take in nutrients. According to the gastroenterologist I saw for a follow-up, all I needed to do to restore the health that had eluded me since toddlerhood was to cut out any trace of gluten from my diet. That day, I was given a miracle cure. And over the next 10 years, my cure became a fad. I can think of something even more annoying than someone ordering rice pasta. It’s being sick without known cause or cure. A study of more than 1,400 primary care patients found that 22 percent of them had “multiple, medically unexplained physical symptoms.” Here’s what happens when doctors can’t explain our persistent and impairing symptoms: We become suggestible. We follow fads. And then we get mocked for it. It’s true that there’s no scientific proof that most people should follow the gluten-free diet. Is there such a thing as nonceliac gluten sensitivity? Possibly, but nobody’s sure. Are today’s most common varieties of wheat harder to digest than varieties of the past? Again, no one knows for sure. Can avoiding gluten decrease the severity of symptoms for autoimmune sufferers? You guessed it: There’s no answer. But commerce depends upon certainty. It’s easy to find online nutritionists claiming that 30 percent of the population suffers from gluten sensitivity. There are gluten-free coaches and gluten-free lifestyle magazines and pricey gluten-free membership programs that traffic in miraculous transformations. Market researchers have encouraged food companies to provide more gluten-free options, because, as Harry Balzer, a food researcher with NPD Group, told NPR, “Everyone has digestive problems—everyone.” You can buy a take-at-home gluten sensitivity test for $279, even though most celiac doctors agree that the test is useless. It’s far from ideal to get health information from coaches, marketers, and listserv commenters. But in a country with such an insufficient health care system—one in which patients have such limited time with doctors and diseases that lack pharmaceutical cures, such as celiac, receive little money for research—is it any wonder that we turn to a marketplace so eager to sell us well-being? It’s possible that the entire gluten-free craze might have been avoided if celiac disease hadn’t been ignored for so long in our country. For most of the latter half of the 20th century, American physicians rarely researched or diagnosed celiac, unlike their European counterparts, and they considered the disease extremely rare. Even now that celiac is known to be one of the country’s most common autoimmune maladies, more than a million Americans are still walking around with undiagnosed celiac. They may suffer from unexplained symptoms; they’re at increased risk for a slew of diseases including thyroid disease, diabetes, and cancer; and the Mayo Clinic says they’re four times as likely to die prematurely as someone without celiac. Celiac afflicts 1 percent of our population, but the vast majority—as much as 83 percent—of that 1 percent are undiagnosed. Compare this situation with that in Italy, where every child is screened for celiac disease before the age of 6. Gluten-free food is considered medicine and available in pharmacies, and restaurants offering gluten-free items are strictly regulated. Those with celiac get a food stipend as well as paid time off for medical appointments. Unsurprisingly, there’s no gluten-free craze in Italy. If our country had a sufficient public health response to celiac—if doctors were trained to recognize the multitudinous symptoms of the disease and tested widely for it, if insurance companies agreed to pay for endoscopies, if most people with the disease were diagnosed, and if gluten-free food were considered medicine for this specific and recognizable disease—would the gluten-free diet have taken such hold of our collective imagination? There’s no way to know for sure, but I do know that the trend has sprouted up in a particularly fertile environment. There’s a shortage of information on and screening for the one disease that is definitively caused by gluten. There are some very preliminary studies about the broader dangers of gluten. There are, as always, plenty of people who don’t feel good. And there’s a marketplace ready to profit on the suffering and the half-facts. I understand that the rapidity of the fad’s growth might make the diet seem suspect, but it’s wrong to blame the dieters. We’re mocking those who are trying to help themselves with the limited information they have at hand. We’re pointing fingers at the present-day equivalent of the young woman on the mesa with sores in her mouth eating seitan, and I can tell you with the brilliant clarity of hindsight that she’s not to blame.